In preparation for the opening of classes for school year 2018-2019, and in accordance with DepEd Order Nos. 03, s. 2018 entitled “Basic Education Enrollment Policy” , and DepEd Order Nos. 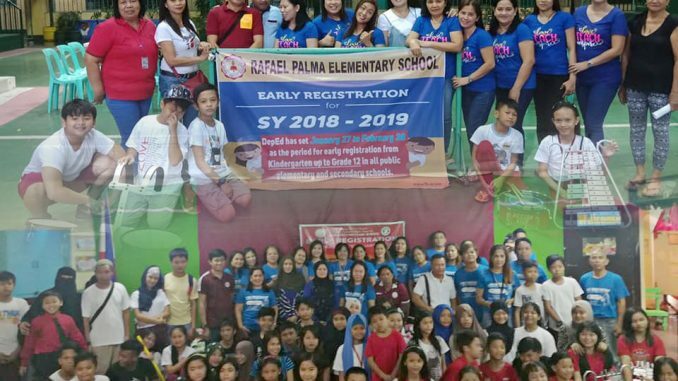 06, s. 2017 about “Guidelines on Early Registration”, a synchronized Division-wide Early Registration activity commenced on January 27, 2018 in all schools of the Division of Pasay City both Elementary and Secondary. Early Registration is a month-long endeavor strictly observed by schools from January 27 – February 28, 2018. Schools’ task force is created and served as the focal team to screen the documents of the enrollees / learners such as birth certificate and report cards and the like. Its primary goal is to ensure that all five-year-old children are enrolled in Kindergarten and to locate, identify and enroll out-of-school children (OSC) and youth (OSYs) who are in difficult circumstances. It also covers learners with certain exceptionalities which require unique learning interventions. Various activities like house-to-house campaign, community parade and meetings with the local and barangay officials were conducted prior to the launching of the activity. Schools Division Superintendent Dr. Evangeline P. Ladines, CESO V, together with OIC-Assistant Schools Division Superintendent Dr. Melody P. Cruz; Chief EPS of the Curriculum Implementation Division Mr. Librado F. Torres; Education Program Supervisors and the Public Schools District Supervisors visited , strictly monitored and evaluated the conduct of the activity.